The Shabby Stamper: PCS Easter Blessings! The issue of the 2012 Sampler release is upon us. We're bringing back another issue based soley on Easter projects. On February 10th, the "Easter Blessings" will showcases baskets, bunnies and pastel themed projects to coincide with spring colors. 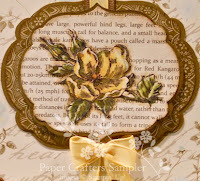 Included in this month's issue is the newest, exclusive template. "Bentely Bunny". Fill him with goodies, flower springs or brighly coloredEaster eggs. Remember to use the code PCS-LH!